The 2006 New Jefferson Nickel: A Frontal Portrait of a President on US Coinage. On January 12, 2006, the United States Mint launched into circulation the new Jefferson nickel. 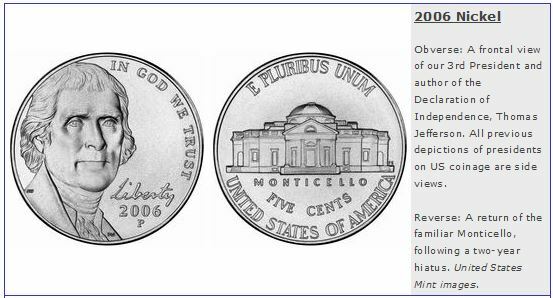 The 2006 Jefferson nickel is the first circulating US coin to feature the likeness of a President facing forward. The Nation's coinage has shown only profiled views of presidents since the introduction of the Lincoln cent in 1909. The Mint has named the new Jefferson nickel "Return to Monticello" because of the reappearance of Thomas Jefferson's dignified home to the reverse side of the coin for the first time since 2003. The latest Monticello has slight enhancements to the classic version minted 1938-2003. The new Jefferson nickel is the final stage of the Mint's Westward Journey Nickel Series that celebrated the bicentennials of two major accomplishments of the Jefferson Administration. "This nickel features a forward-looking President Jefferson who recognized that the Louisiana Purchase and Lewis and Clark expedition would expand our horizons in numerous ways" commented Acting Mint Director David Lebryk. "This is a hopeful, positive image, emblematic of a bright future for our Nation." The new obverse image of Jefferson is based on a famous Rembrandt Peale portrait of the future president painted in 1800. The word "Liberty", in Jefferson's own handwriting, is inscribed above the date. There are no plans in the works for a future redesign of the coin, so the forward-looking Jefferson nickel is expected to fill cash registers for many years to come.